The world is in desperate need of alternative energy, and Australia just rode the wave, quite literally, into a new energy paradigm. 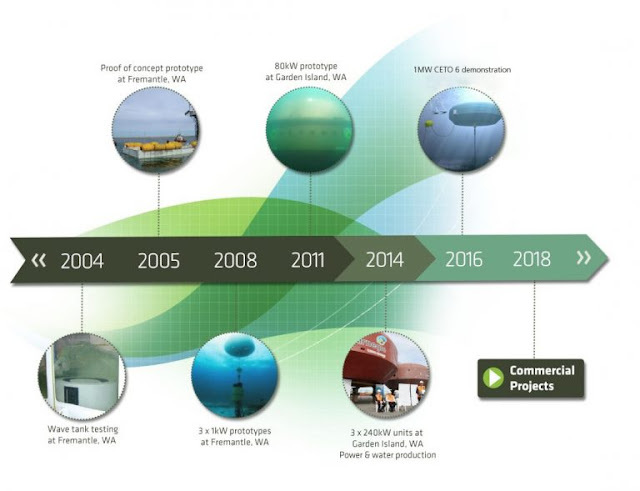 Using the Perth Wave Energy Project’s CETO 5 wave energy generators developed by Carnegie Wave Energy Limited, the movement of the ocean is creating renewable, sustainable energy – which can even be used to make potable water through desalinization. For now, the CETO 5 wave generator is being used to provide energy to a nearby naval base, but future installments of the electricity-generating technology are in planning stages. 3 CETO units channeling energy from the ocean are plugged into a power grid for 14000 cumulative hours of energy. The below video explains how the CETO 5 works. 240kW buoys tethered to water pumps covert the movement of the ocean waves into high-powered water which is then used to create hydroelectricity to power a reverse-osmosis desalination plant. Carnegie Wave Energy claims the technology doesn’t harm ocean life, causes no pollution, and can be placed at different depths of the ocean, so as not to be affected by storms. Australia is one of many places on the planet that can harness wave energy effectively to provide electric energy to its citizens, but there are many more locations around the planet that could benefit from similar technology.